The inchworm goes by several names: cankerworm, measuring worm, looper or spanworm. There are two types of inchworms, fall and spring, with different life cycles but similar life spans. Whether the inchworm is a fall or spring variety, the female transforms into a wingless moth, waiting for the winged male to find her. An inchworm's life span is generally a year, but the timing of his development depends on whether he's a spring worm or a fall worm. The fall inchworm emerges from his pupa in late fall. 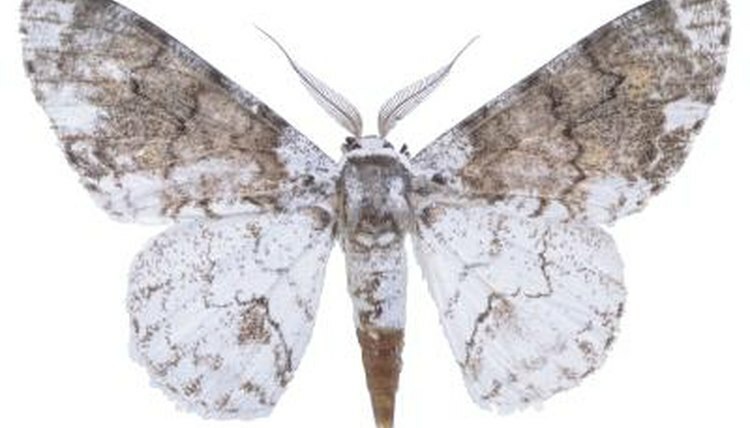 If the emerging moth is female, she'll walk up a tree and wait for a winged male to mate with. After mating, she'll lay her eggs, often around small tree branches, which will hatch in mid-spring. The spring inchworm emerges from his pupa in the late winter, usually in February or March. Like the fall worm, the wingless female waits in a tree for a mating partner and deposits her eggs on limbs for spring hatching. No matter when the eggs were laid, the inchworm's eggs will hatch in mid-spring, usually in March or April. The fall inchworm's eggs have to winter over, but the spring worm's eggs only have to wait a few weeks before they hatch. Hatching is tied to when trees are beginning to show buds and grow new foliage; the new growth provides food for freshly hatched larvae. After the larva hatches, he feeds on leaves for about a month before he drops to the ground via a silken thread. In late spring or early summer, the larva burrows up to 4 inches into the ground, spins his cocoon and pupates. If he's a fall worm, he'll emerge in the fall, usually between November and early December. If he's a spring worm, he'll wait until the next late winter to emerge. The inchworm dies after he mates, ending his short life cycle. Unsurprisingly, the inchworm reaches about an inch in length. The fall worm has a brown or green back with white stripes running the length of his back. He has three sets of prolegs compared to the spring worm's two pair of prolegs. The spring worm is green or reddish brown, sporting a vertical yellow stripe along his side. No matter what season he comes of age, you'll find him in shade and fruit trees, as well as other trees including elms, maples and oaks. Birds and lizards are fond of inchworms for dinner.